Type and Characteristics: Barque/Bark-rigged steam cutter (above, Library of Congress), built by Alexander Stephen & Son, Dundee, Scotland as sealer and whaler, hull reinforced for light ice operations, launched 1881, 1,250 tons displacement, 188ft 6in long x 29ft beam x 17ft 10in draft, compound-expansion steam engine, one propeller. Commissioned in Revenue Cutter Service 3 March 1899, armed with 3-3pdr rapid fire guns, complement not known. Log Period and Areas of Service: 1884 (imaging - 1887-1897), Greely Arctic rescue mission. 1884 - Purchased by US Navy for Greely Arctic rescue mission. The 1881-83 Expedition commanded by First Lieutenant Adolphus Greely, US Army was one of two setting up observation stations in the Arctic. Greely's was left stranded in the Arctic over the winter of 1883-84. US Navy organized a fleet consisting of USS Bear, USS Thetis and the loaned HMS Alert, who together rescued the survivors of the expedition. 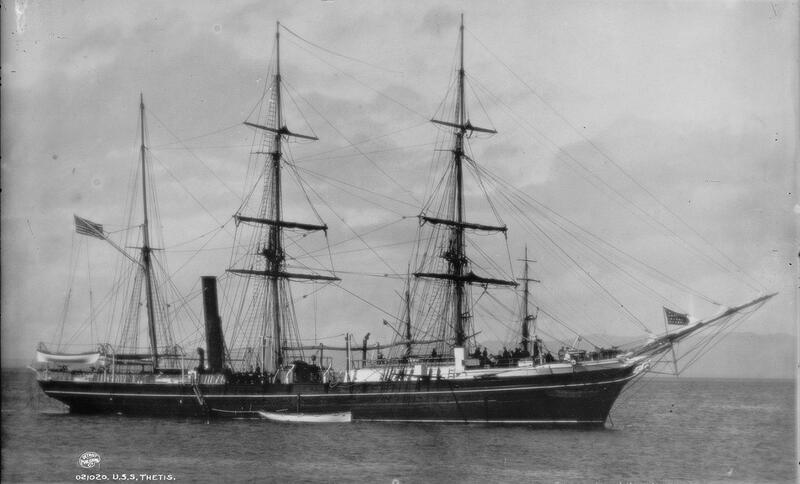 Fate: Transferred in 1899 to Revenue Cutter Service. Sold out of service in 1916. Follow the link to logs while in US Revenue Cutter Service as USRC Thetis.